Nels Hanson Romer was born on January 14, 1871 at Vestilinet Denmark. His father J. J. Romer moved to the family originally to Stutsman County in 1880. Following completion of his public school education in the Jamestown area, he secured a position with the Northern Pacific Railway and eventually qualified as an engineer. He served with the NP Railway 14 years until he became the chief mechanic for the Midland Continental Railroad out of Jamestown for five years. During this period, he dabbled in horse buying and trading. From 1909 to 1914, he served as Stutsman County Sheriff. 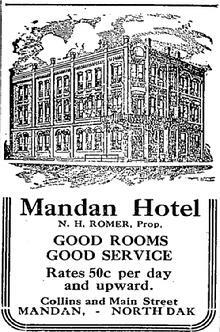 He moved to Mandan in 1916 and purchased the Hotel Mandan Hotel Jane Lauscher, a widow of a very successful Red River bonanza farmer who had purchased it in about 1908. Romer was elected to fill the unexpired term of Mandan city commissioner Nels E. Luther who had died unexpectedly in September, 1921. The special election, held on Friday October 21, 1921 saw the most votes ever cast in a city election to date, with 1533. His opponent was M. C. Heinsohn, a NP engineer. While some newspaper accounts credit the large turnout as a result of the statewide recall vote held on the same date, the Bismarck Tribune reported that "Heinsohn received a great number of votes from persons who are opposed to paving improvements for which Romer was pledged." He then went on to take the job as Mandan's Chief of Police. Married Lillian C. Olson of City Point, Wisconsin in September 1910. The couple had four children who survived to adulthood; Mrs. R. S. Little, Nortonville, ND; Fred N. Romer, Mandan; Madeline E Romer, Mandan; and Walter U. Romer. Among other civic service, he would also serve on the Board of Directors of the Mandan Salvation Army. Romer served as exalted ruler of the Mandan Elks Lodge 1256 in 1924-25 and was prominent in the activities of the order. He was also a member of the Yeomen, AOUWB of LE, the Woodmen and Mandan Rotary Club. As a young man, he was affiliated with the Congregational Church. Chief Romer was shot and killed in the line of duty on December 25, 1926 responding to a domestic disturbance call. Romer entered the kitchen of the home of Arnold Thiele at about 12:30 PM. Thiele was intoxicated and pointing a gun at his wife and their four children ages 4 to 9. (NOTE: in 1926, the nation was in the midst of "Prohibation", when the production or sale of liquor of all types was illegal). Romer entered the home, unarmed, and attempted to negotiate with Thiele. Tragically, the man turned the gun on Romer and shot him. Thiele left the house, drove into town and shot two additional citizens before being arrested by the county sheriff Charles McDonald assisted by a local citizen, John Klein. The sheriff took the man to Bismarck to prevent an angry mob from lynching him. Defended by William Langer, Thiele's trial was moved to Bismarck. He was found guilty of murder and sentenced to life imprisonment at the ND State Penitentiary. The Palace Theater was pressed into service to accommodate the expected crowd for Chief Romer's memorial service. Despite the time of the funeral being passed only via word of mouth, the venue was packed to overcrowding, with hundreds turned away. Members of the Rotary Club, the City Commission and delegations from multiple organizations including the Bismarck Police attended. After the service, Nels Romer's body was transported via rail to Jamestown, where he is buried.